A small party of MM trustees has recently returned from a visit to Tunguli and saw the ambulance in action. Feedback from the villagers in and around Tunguli was extremely positive and they expressed their great thanks for the arrival of the ambulance. Tunguli Health Centre serves a rural catchment area of some 250 square miles with a population of around 50,000 people. Patients travel up to 15 miles on mud roads on foot, by bicycle or (if they are really fortunate??) by piki piki (motorcycle taxi). None of these options is suitable for pregnant women or others in need of medical care or treatment. It was clear from our earliest contact with the HC that some form of ambulance transport was needed but the problem was how to afford it. The second wonderful moment was when a benefactor offered to fund an e-Ranger in memory of her late husband. She wanted a lasting memorial to Ivor, which would bring benefit to the lives of others. This bequest has also provided funding to cover operating costs of the ambulance for the first three years, during which time we aim to establish a long-term support model to ensure sustainability. Well it all took a bit longer than we had hoped, due mainly to the usual delays at the port in Dar Es Salaam, but since September 2016 the ambulance has been in action. The driver has been trained, pic of Tito on the ambulance the ambulance commissioned and patients are benefitting. Our driver, Tito, reports that the e-Ranger is very manoeuvrable and over rough roads can travel more quickly than a large 4x4. During its first month of operation the ambulance transported around 30 patients to and from the HC and also to Berega Hospital for more specialist treatment. Many of these trips involved emergencies such as caesareans and serious illnesses such as fractures, malaria and pneumonia. 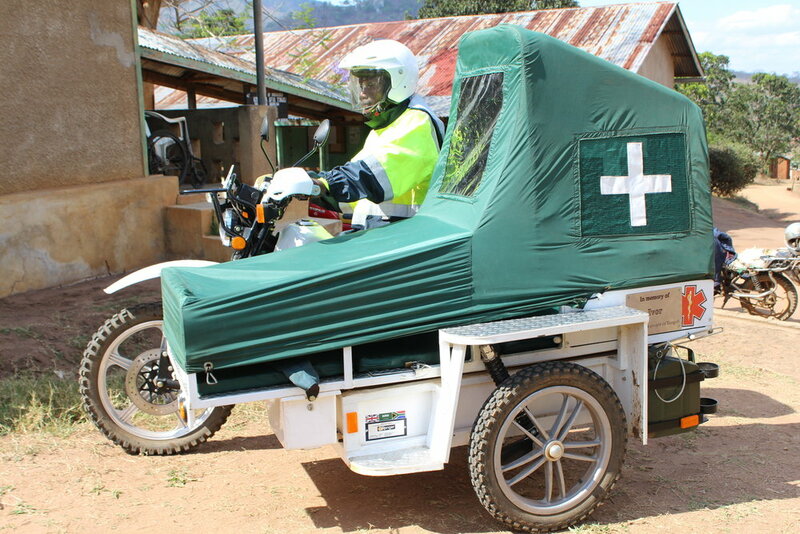 As the short rains approach (December) the roads will become more difficult and incidences of malaria will increase so the ambulance will be working flat out. A part of our plan for the future is to run outreach clinics for more remote communities and the ambulance is likely to be a key part of this programme also. Who knows, perhaps a second e-Ranger one day?